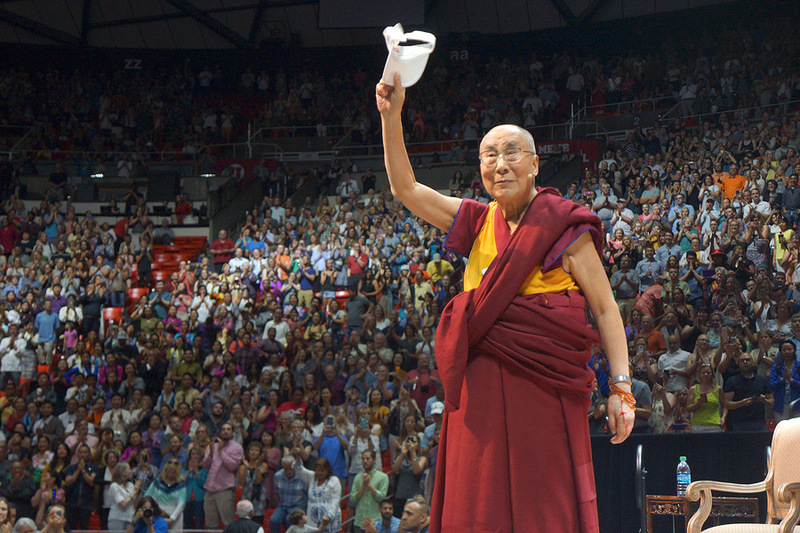 The Salt Lake Tribune reported on His Holiness, the Dalai Lama, in a visit to the Huntsman Center. He said the quest for world peace, oddly enough, should emphasize action over prayer. “I am a Buddhist, and prayer is part of my daily practice,” the Tibetan told the nearly full venue at the University of Utah. “Individual prayer is relevant and useful. For society and the world, though, prayer is not meaningful.” He added, peace “comes through actions” and that humans have compassion within them. More than 200 million died in violent acts in the 20th century, the Dalai Lama lamented. “We need to create a better relationship on this planet. … Today’s reality must change. We cannot do it with old thinking. … We must create a new way of thinking, offering a global message” that transcends national boundaries. The Tibetan leader is hopeful, especially about our upcoming generations. He is working on an educational curriculum to address modern problems built on “moral ethics” and “not on a religious approach.” The Dalai Lama Fellows, furthermore, is a global network of young social innovators working for the cause of peace, justice, and ecology. The organization supports and guides them to deepen their service by merging social innovation with contemplative values, ethics, and compassion.